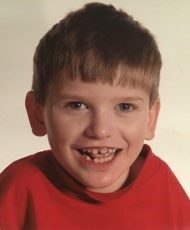 Born Aug. 29, 2000 Brett lived a joyful and fulfilling 18 years of life despite his terminal heart condition and disabilities. Brett had an infectious smile and laugh, a “can do” attitude and touched the lives all who knew him. Brett was educated in Lewiston schools until 8th grade when he moved to Stratton with his mom and brother. He attended Stratton school and was currently a student a MTA in 12th grade looking forward to graduation this year. He lived life to the fullest and enjoyed playing video games, watching cartoons, fishing, Special Olympic events, Pine Tree Camp and his dear friend Hannah Holland. Together, Brett and Hannah shared good times, laughs, dinners out on the town and most special of all, The MTA Prom last year at Sugarloaf. He and Hannah shared a special dance that will never be forgotten. In his last days of life, he did what he wanted to do, despite his failing health. He attended school wearing his Spiderman costume showing off his big built in muscles and washboard abs. He also participated in trunk or treating in Stratton. He is survived by his Mother Trisha Lebeda of Stratton, his father Robert Moon Jr. ,brother Bryce and sister Samantha Moon all of Lewiston and his maternal grandmother Carol Lebeda of Auburn, His aunt Dana, cousins Jon, Karen, Danni. He will be forever etched in our hearts. A celebration of life at the Stratton School in Stratton on Sunday the Nov. 11, 2018 at 11 a.m. Also a celebration of his life will be held at the at the East Auburn Baptist Church Tuesday Nov. 13, 2018 at 6 p.m. Arrangements are under the care of Wiles Remembrance Center; Adams-McFarlane Chapel 137 Farmington Falls Rd. Farmington, ME. To All of Brett's Family: I am saddened by your loss of such a brave young man. Though I did not know Brett, my son attended Mt. Abram High School with him, and spoke highly of him. My thoughts and prayers are with you all during this very sad time.